Terry Tempest Williams, a Utah-based environmental activist with a Mormon heritage, will receive the Community of Christ Peace Award on 21 October 2011 at the church’s Peace Colloquy on “Creating Hope, Healing Earth” in Independence, Missouri. See the official announcement here. A list of previous awardees is here. Williams is currently Annie Clark Tanner Scholar in Environmental Humanities at the University of Utah. Sticks and Stones and … Compliments? As it turned out, they only wanted to talk about Joseph Smith. Apparently, our faith movement’s founder represented all that anybody needs to know about contemporary Latter Day Saint groups. Eventually most of the fundamentalists/evangelicals bolted from the alliance when an LDS representative was admitted a few years later. They formed their own group, which over time has dwindled in size and influence. I mention this episode as a way to ask, “Do we expect to be misunderstood or misrepresented?” Is this a natural outgrowth of religious discrimination and persecution experienced by our forebears in the almost two centuries of our faith movement’s existence? Although nobody’s getting tarred and feathered these days (at least here in North America, as far as I’m aware), has suspicion become our default setting? This article, by Bill Russell, a professor from Graceland University (the Community of Christ college) is a reprint of the 21 July 2010 installment of his ‘Political Scene’ column in the Lamoni Chronicle. It seems fairly clear to me that one person – and probably the main person — these communications were aimed at is Glenn Beck, himself an adult convert to Mormonism. A former alcoholic and cocaine addict, I think Beck’s conversion to the LDS Church made a lot of sense. The church’s strict teachings on alcohol and other drugs has probably helped Beck recover from these addictions. UPDATE 11 January 2010: Kenny and Jake Ballentine, two brothers who make films together, have just announced the upcoming release of a new movie ‘Trouble in Zion’, a documentary on the Missouri Mormon War. Several years ago, Kenny Ballentine read the essay attached to the below posting and talked with me about it while making the film. Click here to find out more about their movie. The 1838 Missouri Mormon War (see LeSueur’s great book) resulted in at least 22 fatalities, millions of dollars worth of property destruction and the displacement of 15,000 people. Fought in a context of fierce rhetoric, sectarian and paramilitary violence, weak governmental authority and a privatization of military force, it actually bears significant resemblance to what some security scholars (e.g. my former PhD supervisor Mary Kaldor) have called the “New Wars.” These contemporary conflicts in places like the Former Yugoslavia, Chechnya, Columbia, Rwanda, Somalia and Sudan are characterized by the targeting of civilians; powerful non-state actors; prolonged, seemingly intractable, hostilities; connections to organized crime; and exclusivistic ethnic, religious and sectarian ideologies. The good Lord who had sent the Lakwena decided to change his work from that of a doctor to that of a military commander for one simple reason: it is useless to cure a man today only that he be killed the next. So it became an obligation on his part to stop the bloodshed before continuing his work as a doctor. Alice Auma, assuming the name Alice Lakwena, led a insurgency against the new government, known as the Holy Spirit Movement, which had several early victories before being defeated by the new Ugandan Army. (For more information on Alice Auma/Lakwena and the Holy Spirit Movement, see this book or this article). Alice Lakwena, as a religio-military commander, stands in a long tradition of Warrior Prophets that extend as far back as Joan of Arc, Guru Gobind Singh, Mohammed and King David. Warrior Prophets have been particularly prominant in modern Sub-Saharan Africa, associated with guerilla movements in, for example, Zimbabwe and Sudan. In areas of the world where political authority is fragmented and the state does not have a monopoly on the use of violence, savvy and consummate ‘political entrepreneurs’ take advantage of their ability to wield violence to rise to power (and often prosperity) by offering security to people willing to accept their authority and punishing those who are unwilling to do so (For further information, see this book on warlordism in Africa, or this one on Afghanistan). Likewise, Paul Gifford, a scholar of African Christianity, has argued that charismatic and dogmatic religion provides believers with a sense of stability as Africa faces great social, political and economic upheavals in its encounter with modernity. Warrior Prophets are thus able to capitalize on the dual opportunities created by chaos — people’s perceived needs for 1) a powerful, paternalistic protector and 2) a charismatic diviner who is able to provide assurance of cosmic certainty. They offer the promise of both physical and spiritual security. 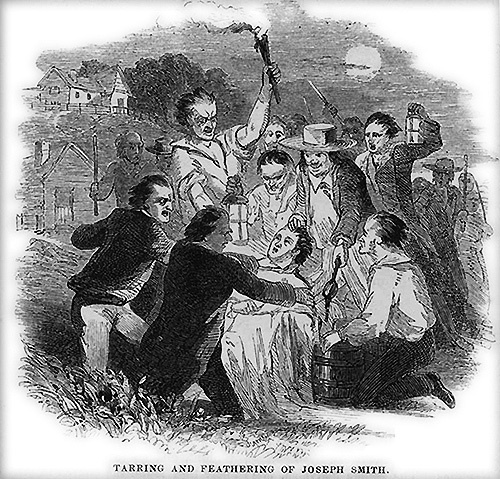 It may be enlightening to understand Joseph Smith, Jr., the founder of both the Mormon and Community of Christ churches, as having played a similar role in mid-19th century America. His time was one of great political, social and economic upheaval. On April 6, 1830, when six men including Joseph Smith Jr. came together in upstate New York to organize a church, they founded a new religious movement. When they chose the name “Church of Christ,” they created a brand identity problem that has been with that movement ever since. SaintsHerald.com is an independent blog and is not affiliated with the church, its official CofChrist.org website, or its monthly Herald magazine.